During the Panic of 1907, as Wall Street was crashing down and the contagion was spreading globally, JP Morgan, then 70 years old, summoned the heads of New York's banks and trusts to his library and study. He famously locked the doors, and forced them to work through the night and eventually agree to a deal to bailout the weaker ones. At the time, there was no American central bank, and so Morgan was effectively the lender of last resort (his rescue led Woodrow Wilson to set up the Federal Reserve in 1913). A more incongruous meeting place for anxious bankers could hardly be imagined. In one room were lofty, magnificent tapestries hanging on the walls, rare Bibles and illuminated manuscripts of the Middle Ages filling the cases; in another, that collection of the Early Renaissance masters - Castagno, Ghirlandaio, Perugino, to mention only a few - the huge open fire, the door just ajar to the holy of holies where the original manuscripts were guarded. As we know, another emergency gathering of the bank honchos was held in New York more recently. On the weekend of 13-14 September 2008, then treasury secretary Henry Paulson brought together the heads of the major banks. That emergency meeting too was held in an impressive work of architecture - the Federal Reserve Bank of New York building. As Andrew Ross Sorkin writes in Too Big to Fail (which I reviewed here), it is a "limestone and sandstone building, which was modeled after the Strozzi Palace of Florence". It has a three-level vault, fifty feet under sea level, holding $60 billion of gold. However, unlike the Morgan library, the New York Fed buidling was not the site of a successful intervention, as Paulson could not engineer a rescue of Lehman Brothers. 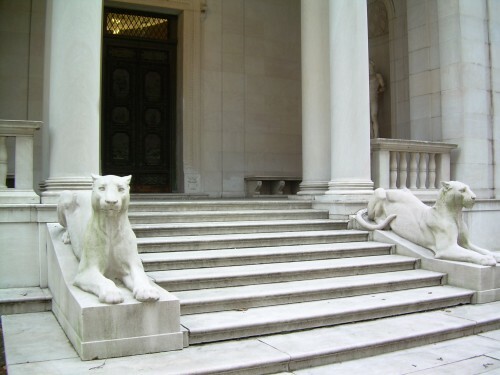 The Morgan library and museum has an incredible collection for a relatively small space. Its website is here, and you can read more about it here.